In every way, Zetta was created as the Next Generation of NexGen. In previous RCS Connect articles, I have been charting a path from a NexGen function to the same feature in the new Zetta universe. While they typically produce similar results, there are some different ways of getting there. In this article, I wanted to highlight one of the many compatibility bridges we have employed in Zetta to help the radio group that is very familiar with NexGen and starting to employ some Zetta. You still want to be able to leverage our industry leading interconnectivity between sites, so we invented a way for your to not lose that capability going forward with Zetta. In version 3.0.1 of Zetta, we introduced a “Content Ingest” tab, which at the moment only houses NexGen Voice Track Ingest. You indicate what folder you wish to have Zetta look for voice tracks in NexGen from this screen. Once you get NexGen’s Wancast receiver (STSR) installed on the Zetta site, it’s simply a matter of creating the mappings in NexGen and pointing to the correct location and station number. Zetta’s station # is found in Station Config. 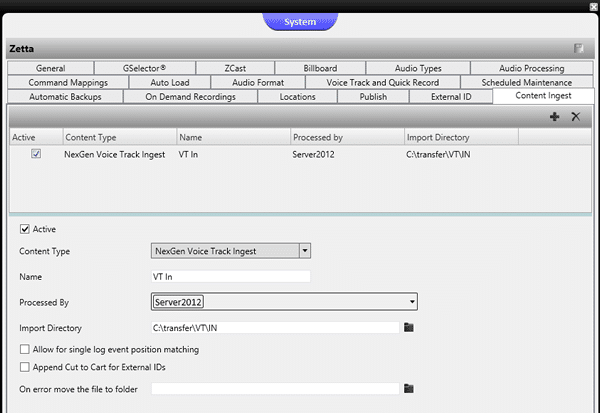 Once set up, it uses the NexGen-like matching processes which looks at the surrounding elements to place the voice track. This is the latest feature to bridge the gap between Zetta and NexGen. In a previous version, there was an addition of a feature to allow voice tracking from a Zetta station back to a NexGen station, the ability to send audio assets around from NexGen to Zetta, and some time last year, we wrote a small helper application to automatically Wancast updated assets active on a virtual station in Zetta to a station in NexGen. As you make the journey from NexGen Digital to Zetta, we will be along the way to help you get to where you want to be.